David and Jennie Curry moved to Yosemite Valley in 1899 and established a family campground at the base of Glacier Point, called Camp Curry. The camp opened for business on June 1, 1899 and provided accommodations in as many as seven canvas tents, beneath the towering cliff, at a nightly rate of $2. Many, including Yosemite pioneer Galen Clark, predicted that the enterprise wouldn't succeed, since the site was so cold and isolated. Most visitors still preferred the more comfortable accommodations that could be had at the Sentinel Hotel for $4 a night. That summer 4,500 people visited Yosemite Valley and only 290 of them stayed at Camp Curry. But David Curry had a few ideas to make his camp more attractive to visitors, and one of them was the reintroduction of the Firefall. The attraction was seen only rarely after McCauley's departure from Glacier Point, but Curry intended to make it a nightly tradition. He saw a clear commercial potential in the Firefall, reasoning that crowds would gather each night for the event, and end up patronizing his dining and camping concessions. And it certainly worked! One of the great advantages of staying at Camp Curry, was the very fact that it was isolated in its corner of the valley. Many campers preferred the seclusion of the camp, but most importantly, from the camp one had a perfect view of the Firefall each night. "The original Stentor was a captain in the Greek army in the days of Homer and the Iliad. It was said of him that he could command 10,000 troops by the use of a megaphone. 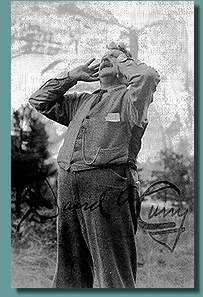 But the modern Stentor lives at Camp Curry in Yosemite Valley, and his voice is heard at Glacier Point, eleven miles distant by the long trail." He would then throw his head back, cup his mouth with his hands, and shout to the fire tender on Glacier Point, "Is the fire ready?" The faint answer could then be heard, "The fire is ready!" followed by Curry's roaring command "Let 'er go Gallagher!" And the glowing embers would begin their plunge off the edge of the cliff to their resting place on a ledge 1,700 feet below. Presumably Gallagher was the regular fire tender at that time. The call was changed to "Let the Fire Fall!" in later years. "We are not going to do anything for you. I'm not going to give you anything you ask for. Furthermore, I'm going to take something away from you... I'm going to take the Firefall away. There will be no Firefall." 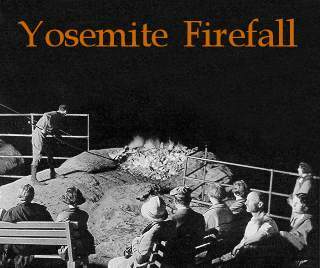 The Firefall was reinstituted in the summer of 1917, however David Curry never got a chance to see the spectacle again, as he died of blood poisoning in April of that year.